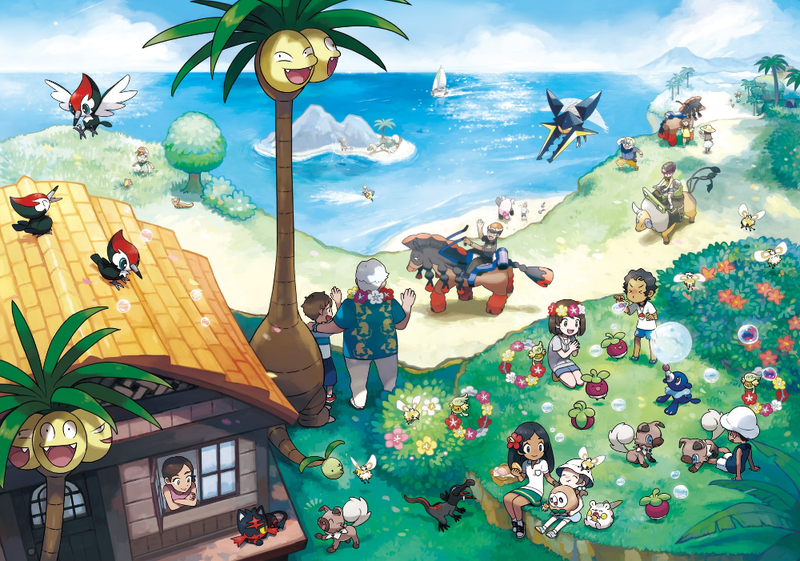 Earlier this year, a leak appeared online alleging to contain some new, unconfirmed information about Pokémon Sun and Moon. There was even some concept art floating around. At the time, it seemed like bunk. But with yesterday’s big reveal, it seems more likely that the leak was true all along. There would be no traditional gyms. The starters would evolve into an archer, wrestler, and a siren. “Diamonds,” which function somewhat like Mega Stones, could cause Pokemon to transform in some way. There would be a fire/poison type monster revealed. Yesterday, Game Freak inadvertently confirmed many of the details in the leak to be true, or at least mostly true. As we reported yesterday, Pokémon Sun and Moon do not seem to have gyms. Instead, the player takes on challenges known as “trials,” and if victorious, the player has a chance to encounter something known as totem Pokémon . This fits in nicely with the leak’s allegation that there would be no gyms, and that each area would have its own Pokémon overlord. Pictured: the toy version of the bracelet. Some aspects of the leak have not proven to be true so far, like new creatures based on things like snowmen. But enough of it seems spot on, as long as you provide some wiggle room for translation differences. Other details may just be a matter of time. We know for example that Rockruff “hides a secret” according to its official description, which could indeed mean that it will evolve into a werewolf. We also know that, despite being tropical-themed, there are an abundance of ice monsters—so a snowman doesn’t seem out of the question. UPDATE 10/18 9:56 AM: The leaks have been confirmed to be true, according to recent datamining efforts. You can see the 3D sprites of the final starter evolutions here. If true, this starter leak would join a long list of Pokémon related leaks, which have spoiled the surprise on things like new monsters, mega evolutions, new settings/locales, and more. Back before X & Y were released, a leaker alleged that “heads were rolling at Nintendo” because of how much information filtered out in the wild. As we already know, the whole point of releasing modern Pokémon games worldwide at the same time was to maintain a semblance of mystique for everyone, rather than enabling people to look up what players in Japan had experienced months beforehand.